A recent joint report by Google and Singapore’s Temasek Holdings has revealed that Southeast Asia’s internet economy could be worth more than US$240 billion by 2025 – surpassing previous estimates of US$200 billion. One of the key drivers of this burgeoning internet economy is the e-commerce sector. Over the past three years, it has been the most dynamic sector of the digital economy accounting for close to US$11 billion in gross merchandise value (GMV) in 2017 and is predicted to exceed US$23 billion by end-2018. By comparison, in 2015, the sector’s size was only US$5.5 billion and the quadrupling since then represents a 62 percent compound annual growth rate (CAGR) over the period. Driven by increased consumer trust in e-commerce companies, the report estimates that the sector will exceed US$100 billion by 2025. Pertinent to the development of the sector has been the three largest e-commerce players in the region – Lazada, Shopee and Tokopedia. Collectively, they have grown more than seven times since 2015, well eclipsing others in the sector. By offering tens of millions of products, frequent promotions, better mobile user experiences and an extensive logistics network, they have been the primary forces behind the dramatic surge of e-commerce in Southeast Asia. The increasing role played by these three top players is also evident via other important engagement metrics. This confirms a trend that sees growing consolidation of consumer preferences. With a large user base and seller base on their respective platforms, they have been directly responsible for contributing to the rapid rise in popularity of e-commerce amongst Southeast Asians. Indonesia has led the way in the healthy growth of the e-commerce sector in Southeast Asia, reaching US$12 billion in 2018 and accounting for more than half of transactions in the region. 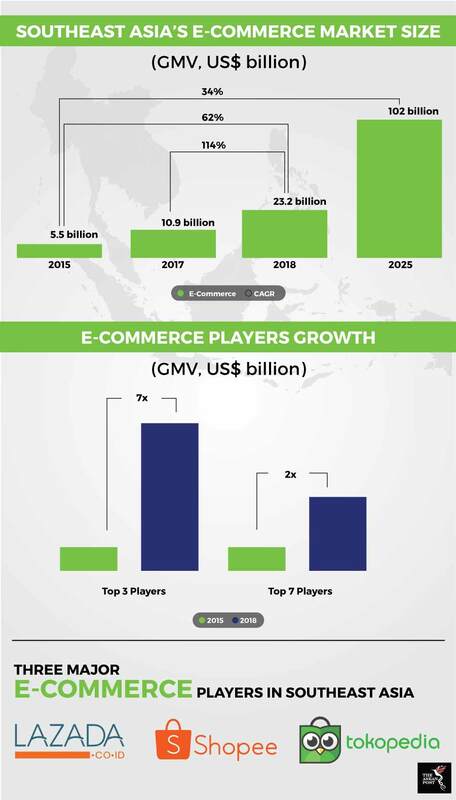 Thailand and Vietnam have also seen accelerated e-commerce adoption, reaching close to US$3 billion in 2018. Across all markets in Southeast Asia, consumers are increasingly reliant on e-commerce companies to purchase wide ranging products from daily groceries to mobile devices and computers. As the e-commerce sector continues to mature, the report highlighted that the basis of competition and key growth drivers will see parallel changes. E-commerce players will increasingly vie for leadership in each geographical market with Indonesia being the primary battleground for regional and local players. As such, we will also see expansion from metro cities to second-tier cities and rural regions where e-commerce penetration is low for now. These places provide the highest growth prospects in terms of expanding e-commerce consumer bases. Leading marketplaces will compete for preference amongst key consumer segments like “Young Females” and “Fashionistas.” Besides that, category leadership in verticals like “Apparel” and “Health & Beauty” will also be up for contention as e-commerce players compete to come out on top in these segments. In terms of financing their businesses in the longer term, e-commerce players have little to worry about. The internet economy in Southeast Asia has experienced dramatic growth in fundraising over the past four years. In 2015, funding by venture capitalists, private equities and corporate investors crossed the US$1 billion mark. On the back of this milestone, investments have surged at an exponential pace. E-commerce players have received sizeable cheques from investors, raising US$8 billion since 2016. These include multi-billion-dollar investments in Lazada by parent company, Alibaba as well as fundraising rounds by the Sea Group which owns Shopee. Alibaba recently increased its share in Lazada from 51 percent to 83 percent. It also invested US$1.1 billion in leading Indonesian e-commerce player and rival to Lazada, Tokopedia. The Sea Group which was previously a private company has since gone public in order to tap funds from the equities market and managed to raise US$884 million after being listed on the New York Stock Exchange. E-commerce is undoubtedly an interesting sector to watch as the internet economy in Southeast Asia continues to expand at breakneck pace. With a goal to build sustainable business models, e-commerce companies will increasingly drive monetisation from brands and sellers by providing value-added services such as analytics, logistics and marketing. This will make for exciting competition which consumers can then reap the rewards from.